I'm telling you now... the butler did it! So I happened to be a Kickstarter backer of the Shadowgate remake which was released in 2014 and this remake was developed by a company called Zojoi which is basically ICOM Simulations resurrected. ICOM Simulations was the original developer of Shadowgate along with many other games including one of my first forays into the world of Full Motion Video (FMV) games: Sherlock Holmes: Consulting Detective. Well shortly after the release of the 2014 Shadowgate, Zojoi started selling DRM-free copies of Sherlock Holmes: Consulting Detective through their website (as previously they only sold the game on mobile platforms and Desura). I grabbed them straight away but it wasn't until mid-2015 that the game finally made its way onto Steam. When I originally played the game back in the 1990s, the three cases "The Mummy's Curse", "The Tin Soldier" and "The Mystified Murderess" all came on one CD and together were "Volume 1" of Sherlock Holmes: Consulting Detective. When Zojoi released the game on Steam in 2015, they split the game up into the three cases and sold them separately - however you can still get all three cases together in a bundle called the Sherlock Holmes Consulting Detective Collection for a slight discount. This is what I am reviewing today. I bought the collection on Steam when it was on special during some sale at the end of 2015 for only a couple of bucks so now I have a DRM-free copy of the collection and a Steam copy. It wasn't until quite recently though that I finally managed to replay all of these classic games and I can quite confidently say I'm no better a sleuth than I was back in the 1990s. I guess it isn't so elementary my dear Goninon. So how do you play this game? Well the goal of each case is to discover who is responsible for murdering someone, how they did it and what their motives were. You'll eventually have to go to a judge with all your evidence and select the right answers to the questions he will ask you. If you correctly answer all of them, you solve the case! Pretty simple, huh? The catch? Well you're only able to set foot into the courtroom once you've gathered the right pieces of evidence (and the game doesn't tell you what those pieces of evidence are) plus the more time you spend making enquiries (especially when they end up as being dead-ends) the more points you receive - and you'll want to get as low a score as possible (so you can beat Sherlock Holmes's best score). Each time you interrogate the citizens of London you're treated to an FMV sequence and each case usually has several of them. If you're a fan of the world's most famous detective created by Sir Arthur Conan Doyle, you'll probably find it hard to resist the urge to play just about any Sherlock Holmes game. Not only will you follow Sherlock Holmes and Doctor Watson as they investigate their cases but you'll also come across other characters from the Sherlock Holmes canon such as Shinwell "Porky" Johnson, Langdale Pike, the Baker Street Irregulars and who can forget Inspector Lestrade? Considering how old the game is, it's surprisingly immersive. I don't recall being able to read the newspapers in-game with the original version of the game (you actually had mini physical copies of the newspapers contained in the CD case) but you definitely can now and the way they're presented seems quite authentic - very helpful in immersing yourself in Victorian England. Also, the cases tend to mention things that seemed to be in vogue at the time such as mesmerism/hypnosis and Egyptology. The game can actually be challenging, especially the first time you play since unless you're really paying attention, you might inadvertently talk to people who are unable to offer any clues. Also going too early to the judge will result in you gaining points, which is what you don't want to happen if you want to beat Holmes's score. Seems like a minor thing but I love games where only a mouse is required - that's how you can tell that it's a true PC game ;). Occasionally some of the actors are a bit hammy in terms of their performances or their accents are obviously put on British accents (every so often you can hear the American pronunciation for a word). The FMV is obviously low quality by today's standards since you had to fit all of these onto a CD-ROM which only stores a few hundred megabytes! Once you know how to solve the case it's just a matter of repeating the same steps and picking the same answers when the judge asks you questions about the case at court. The only reason you'd want to replay the game is to get a better score and that's all dependent on how efficient you are. Each of the cases can be finished in under an hour and that was when I was stumbling around basically talking to almost everyone in London before I finally solved the case! Surely this isn't too difficult a thing to add? 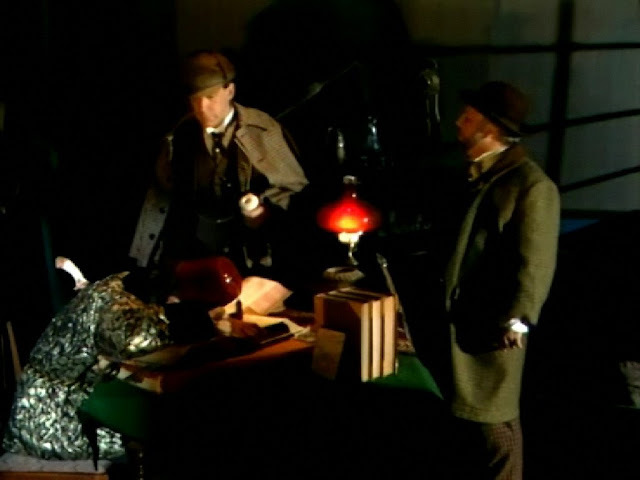 Sherlock Holmes: Consulting Detective is worth giving a go if you want to see an example of a game that helped pioneer FMV gaming back in the early 90s. It's also worth it if you're a fan of Sherlock Holmes in general who wishes to test their sleuthing skills against the great detective. The only criticisms I have about the game are that each case is pretty short, there's limited replay value and the game suffers from simply being too old: 1990s technology meant low quality FMVs and since this technology was new back then, the audience was more forgiving when it came to low quality acting. Is the game worth $4.99 USD? : Yes. While each of the mysteries will take under an hour to complete it's worthwhile taking a trip down FMV memory lane and immersing yourself in the world of Sherlock Holmes.